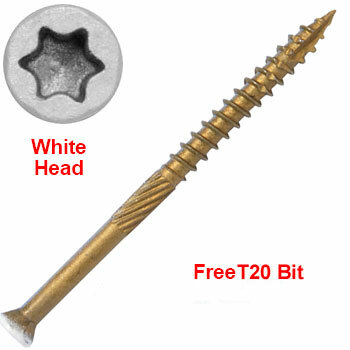 9 x 2-1/2-inch Trim Head Bronze Star ACQ Composite Star Drive Exterior Wood Screws/ 2.5M per carton approx. Includes Free T-20 Bit Painted White Head. Excellent for Trex decking, composite decking, hardwood decking, fencing, door and window extentions, decks and siding etc. Flat Trim Head, Extra Sharp Type 17 Auger Point, Deep Thread, Hardened Steel, ACQ Compatible Coating for long life, For Most Exterior Uses. Available in 1 lb, 5lb and bulk.